It’s time to give our battle a proper intro – we can do this using Battle Start Events. You can set up the battle start events for each battle system type individually – and each battle can override those default events as well. This way you can have special intros to things like boss battles, etc. This time we’ll be using camera positions to get some action into our events. You can read more about them in this how-to. Open the ORK Framework editor and navigate to World > Camera Positions. We’ll need two camera positions, so change the following settings. This camera position is used to create a cool zoom-in effect at the start of a battle. Set to Battle Start Zoom. Set to X=0, Y=0, Z=0. Set to X=0, Y=0, Z=90. That’s it for this camera position. This camera position is used to have a nice view of our battle while fighting. Set to X=-8, Y=13, Z=9. That’s it for the camera positions, click on Save Settings. The battle start event is in charge of playing a battle music clip and spawning/moving combatant’s to their battle spots. Although the battle system will also spawn any combatants that haven’t been spawned yet (but participate in the battle) at the start of the battle, it looks better when doing it in a battle start event – e.g. when the camera is looking somewhere else or the screen has been faded out. Navigate to Events and Click on New Battle Start Event to create a new battle start event. We’ll create a small animation that plays the battle music, zooms in on the fight, fades out the screen in a white flash, places the combatants, set’s up our camera for the battle and fades back in. Click on Add Audio Clip to add an audio clip. This step will store our currently playing music clip and the track’s position – we’ll play the stored music after the battle ends. No further setting. Now we’ll play the battle music we set up earlier. We’ll display a simple message to state that we’re fighting now. This displays the text Fight! in the center of the GUI box, in bold italic text of size 40 and red text color. Now it’s time to use our new camera positions – we want to zoom in on the battle (arena). We don’t want to just set the position, we’ll fade to it, creating a cool effect. Set Value Type to Value. Now we’re fading out the screen in a white flash. Select a white color with no alpha (R=1, B=1, G=1, A=0). Select a white color with full alpha (R=1, B=1, G=1, A=1). This will place all already spawned combatants (i.e. mainly our player) at their battle spots. This will spawn all not yet spawned combatants at their battle spots. This simply let’s every combatant group look at the center of their enemies. No further settings. We need another small wait step to make sure fading to the new camera position has finished by now. Otherwise our next camera position change can get interrupted by the previous. 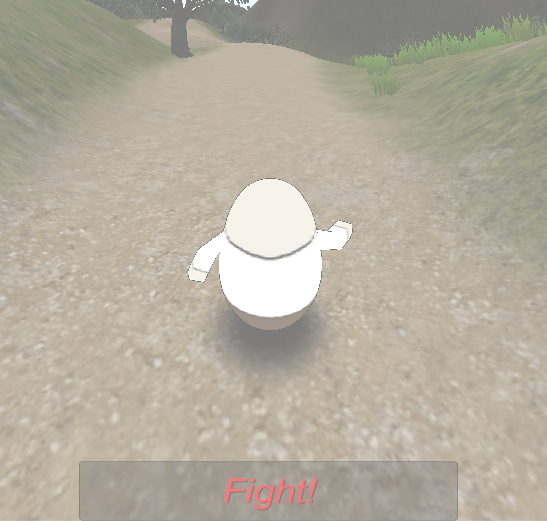 Now we set the camera to use our Battle View position. And now, fade in the screen again. We can simply start from the last color we used here. And that’s it for the battle start event – click on Save Event and save it as simpleStart in Assets/Events/Battle Start/. 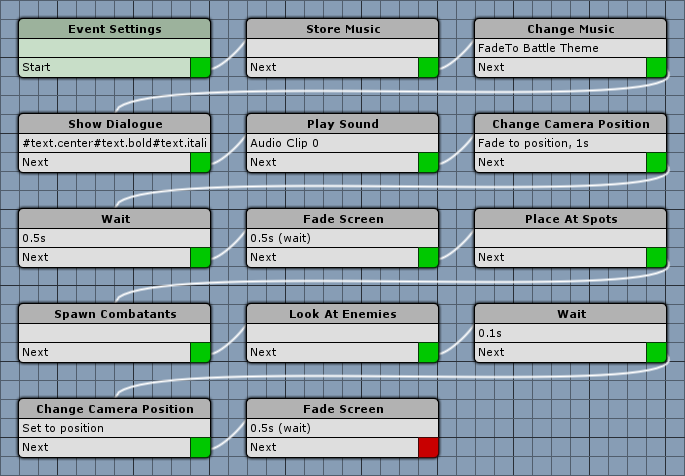 We have to set up the battle start (and battle end) events for each battle system type individually. We’re currently only using the Turn Based Battles, so navigate to Battle System > Turn Based Battles and change the following settings. As always, open the main menu scene (0 Main Menu) and hit Play. Walk outside of the town and into the battle – and be amazed by the cool start event we just created! And that’s it for now – the next lesson will cover battle end events.